After first being announced back in May 2017, Shuttle have now announced pricing for their new Shuttle XC60J mini PC mini PC which is the company’s first boundless PC in a 3 litre format which includes an Intel Celeron J3355 dual-core processor (2 GHz) in 14 nm architecture. Serial interfaces are used more frequently than you would expect in vending machines, checkout systems, machinery and in many areas of automation and control. This product, which, at first sight, might sport some rather unusual features by today’s standards, combines the very latest energy-saving technology with already proven technology that has been around for decades and is still in use today. 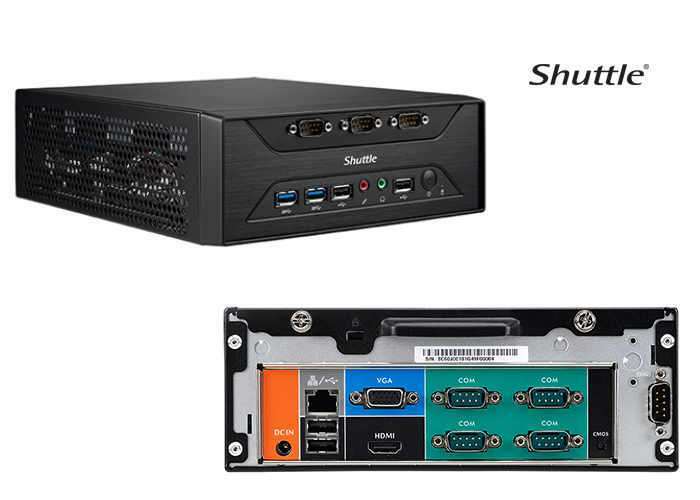 The Shuttle XPC slim Barebone XC60J is a fanless barebone PC is fitted with two free M.2 slots (1x M.2-2280 and 1x M.2-2230) can be used, for example, for an NVMe SSD and a WLAN module. Front and back panel reveal 1x HDMI, 1x VGA, 2x USB 3.0, 4x USB 2.0, Gigabit Ethernet, audio connections and the mentioned eight serial interfaces. Instant system start-up, once power is applied, can be forced by setting a jumper. This is ideal, for example, if the machine is installed in a remote and difficult to access place or if there is a power outage. The actual power supply is 19 V. Alternatively, the XC60J can also be operated at 12 V.
For more information on the new Shuttle XC60J mini PC jump over to the official Shuttle website for details by following the link below.